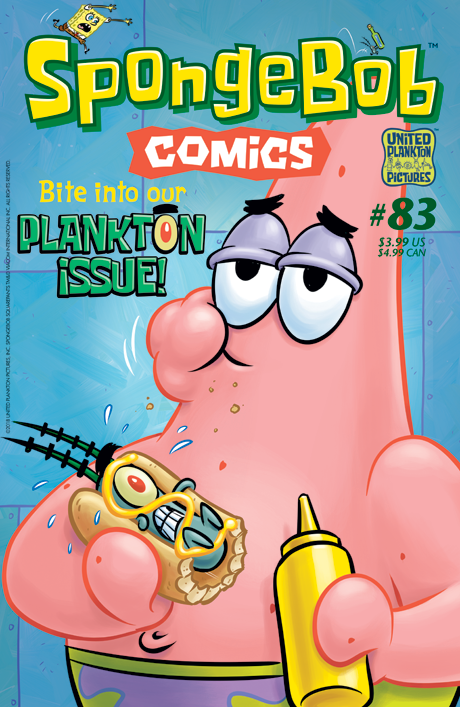 Plankton has taken over another issue! In “The Goo, The Bad, and the Ugly,” the little green megalomaniac tastes success at last as Bikini Bottom tastes the Chum Bucket’s new amazing spicy sauce! Then, in “Plankton’s Country Cousin,” microscopic hillbilly relative Rupert makes time with Plankton’s very own computer wife, Karen! Can SpongeBob help Plankton find a different love match for Rupert? Plus: 6 pages of Sponge-insanity from Bill Wray, “SpongeFunnies” by James Kochalka, and ocean facts by Maris Wicks!